Yesterday a boat carrying asylum seekers, sunk off Christmas Island. The vessel was dashed like a matchstick agains the rocks, while helpless islanders could do little more than throw ropes and life jackets. As for those sailing in her, many of them saw their hopes for a better future lost at sea there. The zodiac sign Pisces has a particular affinity – through its modern ruler Neptune – with the sea. Christmas day, too has a link with Pisces, the fish being the symbol used by early Christians to identify themselves. Jesus himself was a ‘fisher of men’. Pisces is also connected to the idea of the victim. The planet Uranus on the other hand, is commonly linked to the idea of freedom, autonomy and revolution. Since Uranus entered Pisces, it has become common to see pictures of dead bodies that have been washed like flostam and jetsome ashore. These drowned victims of the desperate desire for a better, freer life in the West have become in my mind one of the enduring and saddest symbols of Uranus in Pisces. Though, we do not have a time for the actual shipwreck, we do know it was in the early morning. 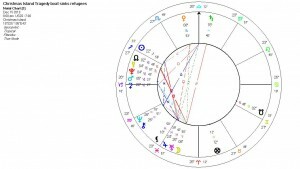 This horoscope is for an assumed time of 08.00 on December 15th 2010, Christmas Island, Australia. With retrograde Mercury conjunct the North Node, Pluto and Mars, the desperate cries for help and the fear of death are almost audible. 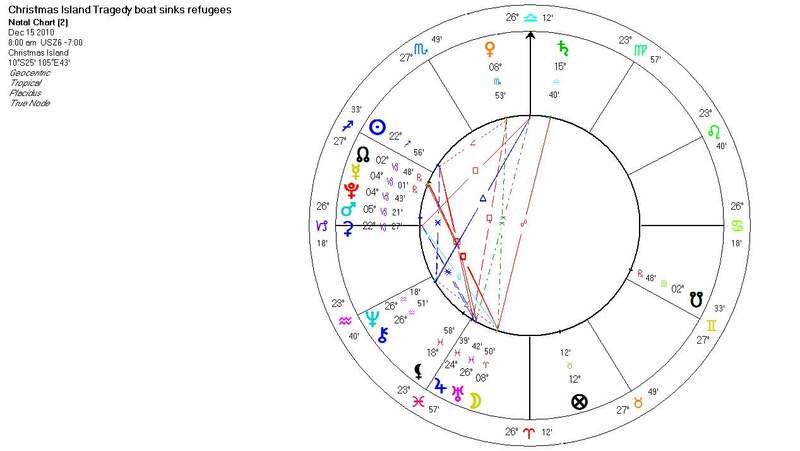 Pluto rules fear – and psychological anguish. The power of nature – Capricorn is an earth sign – can be abosolutely terrifying. The conjunct planets square the Moon in Aries, which has a particularly violent ring to it. Here the Sun is in ever questing Sagittarius, sign of long journeys and future dreams. The Sun squares Jupiter conjunct Uranus in Pisces – suggesting the risk of a sudden event and we are told that the motor on the boat failed, leaving it floundering in the high seas. What other than sheer desperation would drive people to make journeys like this one? That those who reach shore are often shunted off to asylum seeker centres which are themselves little more than prisons, makes this whole episode in our planet’s history particularly shameful. Christmas is upon us. A time of fellowship and good will to all men. It is poignant that of all places, this ship sank off Christmas Island, so close to Christmas Day. Dit bericht is geplaatst in Astrology English, Uranus en getagdastrology, Christmas, Christmas Island, horoscope, Uranus in Pisces. Bookmark de permalink. Wat mij ook nog opvalt, Liz…….